Check out my excerpt on Coffee Time Romance it will give you a quick taste of what the book is all about. If you do read it, please let me know. I'd love to hear your thoughts. 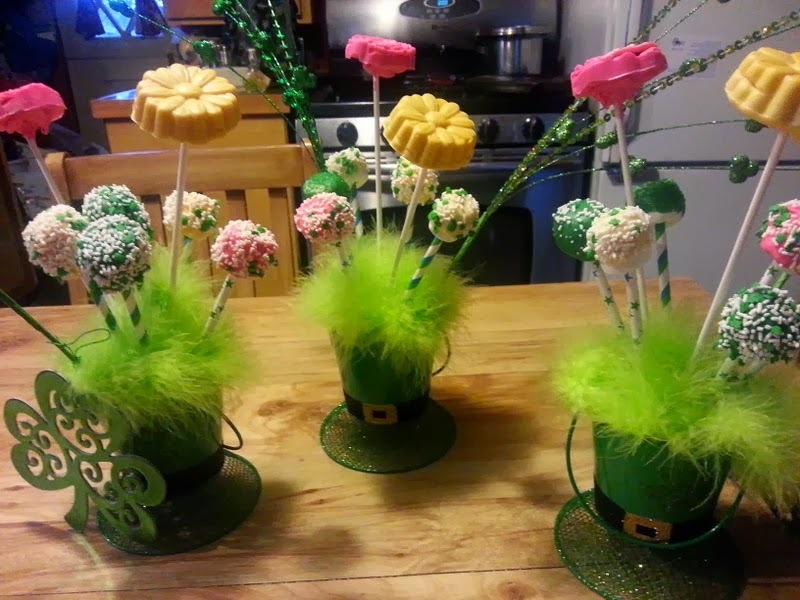 There's no doubt that I love to celebrate...just about every occasion and St. Paddy's Day is a fun day to celebrate. I start out by making a special wreath for the door. 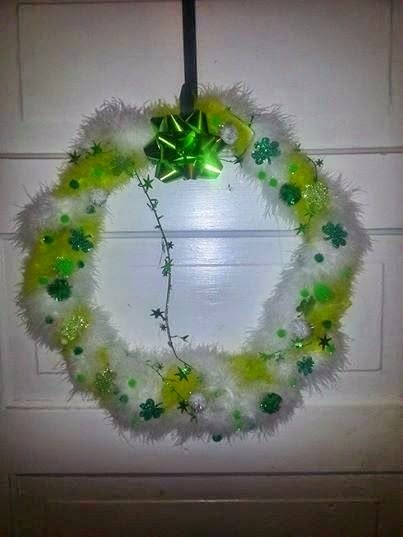 It's simple to wrap a wire frame with some fluffy boa material and then hot glue some shamrocks in place. Any green will do though...you could use fabric, ribbon, or even store-bought garland. Next, I have to make a few treats...what kind of a celebration would it be without food? 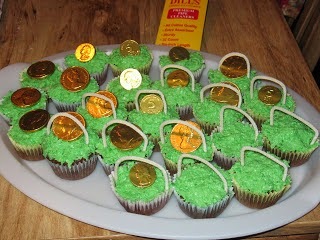 So a store bought cake mix can turn into little pots of gold at the end of the rainbow. Just add some coconut into the frosting and some green food coloring. 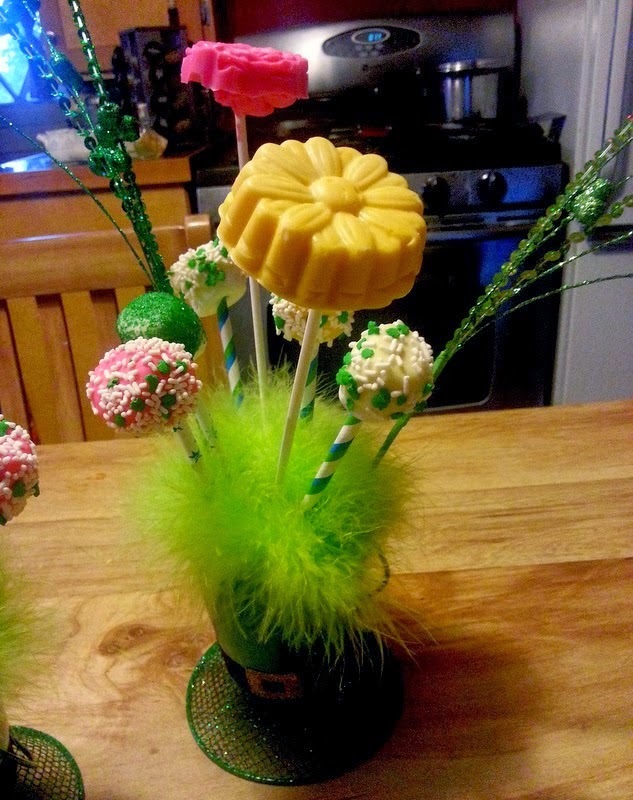 A pipe cleaner for your basket handle and a chocolate coin wrapped in gold (or two) and you've got a special snack. 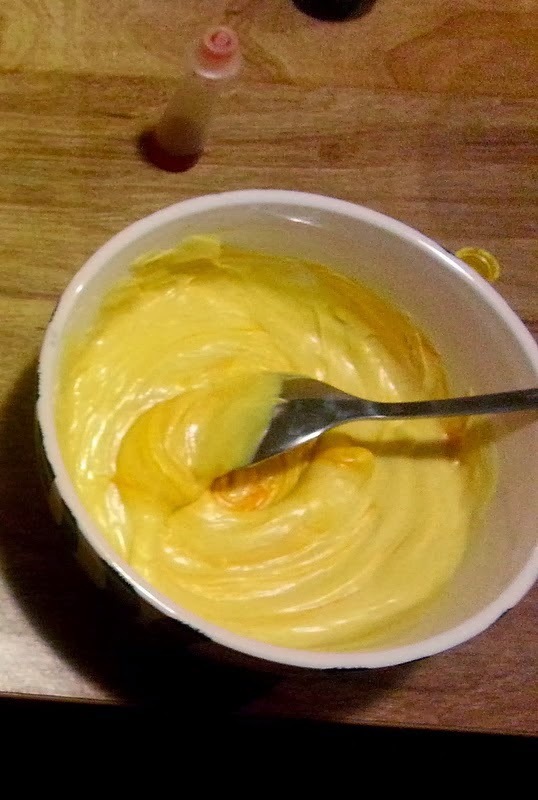 Or if you want to do more than that...simply melt some white chocolate. Add a little food coloring. 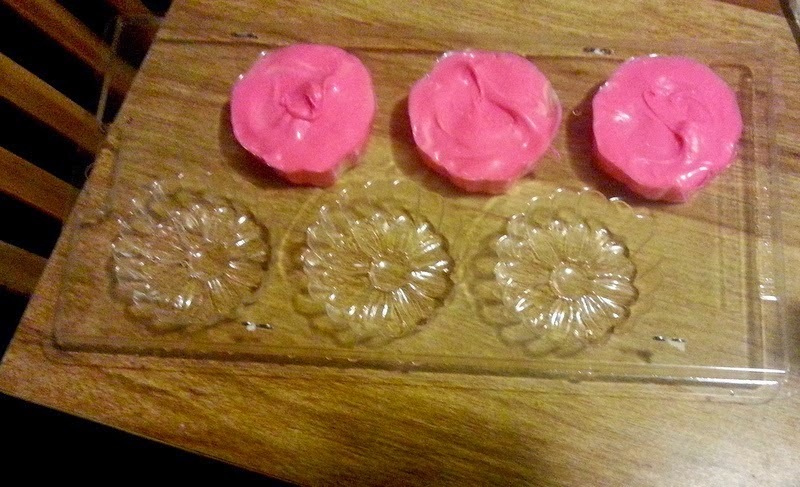 And then pour the pretty paste into some molds. 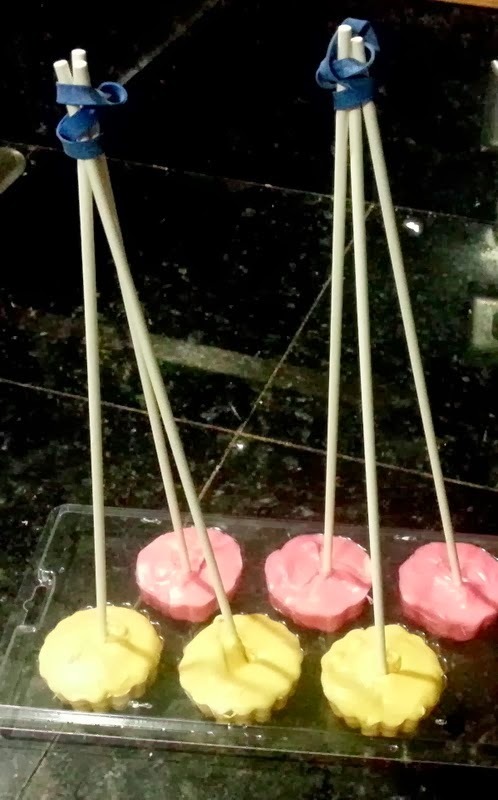 Stick some lollypop sticks into the molds. Prop them together with rubber bands. Then stick them into some floral foam and make pretty bouquets. Then you can take some marshmallows and dip them in the left over chocolate and shake some sprinkles over the top...add a lollypop stick and WAH-LAH! pretty accessory for your food basket. And if these aren't enough ideas...I've got more. But let me say again, HAPPY ST. PADDY'S DAY! 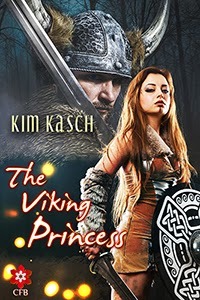 Anyway, here's what the book is about: Everyone knows of Excalibur and King Arthur but few know about his brother-in-law, the Danish Viking Prince and warrior, Holger Danske or his sword Cortana. And few have read the legends of his magical romance with King Arthur’s sister, Princess Morgaine Le Fey, and the tragedy that nearly tore two kingdoms apart. They met on a battlefield, poised against each other, but their attraction was more powerful than any sword, stronger than any warrior and more magical than Merlin, yet theirs is a tale more tragic than Romeo and Juliet.